Artful landscapes are deeply considered spaces that evoke powerful emotional qualities. At Land Morphology we seek to blur the line between art and landscape with the integration of function and the quality of details. The plants, hardscape, and shaping of the land are the media in which we create and form these spaces. Artful landscapes can be further enhanced with the integration of art pieces communicating a desired feeling in a space. The art and the garden form a mutually symbiotic relationship: letting the garden inform the art or the art inform the garden. Depending on the desired impact, the chosen art can be site-specific or stand in contrast to its surroundings. We work closely with our clients to either design the context for a new art piece or to actually create the art. Our collaborative and thoughtful approach forms spaces with deeper meaning and lasting resonance. Below I’ve included a few examples of both site specific art we have created for clients as well as art for which we have sited and created context. These are all examples from In Situ in Redding, Connecticut. Both the garden and the art reflect an abstract view of the surrounding landscape. The wedge- shaped landforms beds frame the sculpture which in turn echo the refined lines and planes of the planting design. The art breaks and plays the with light, mirroring it through the trees, creating a constantly changing environment. The simple, yet elegant stone circle brings all the materialistic elements of the patio to completion. Functional in its integration, it captures and frames the views of the stream and waterfall beyond, but can also serve as a resting/seating point in the garden. Its creates an undisrupted visual boundary between the built and the natural environment. A playful take on the abstract draws color and activity to the pond with glass koi swimming in a school through the water surface. 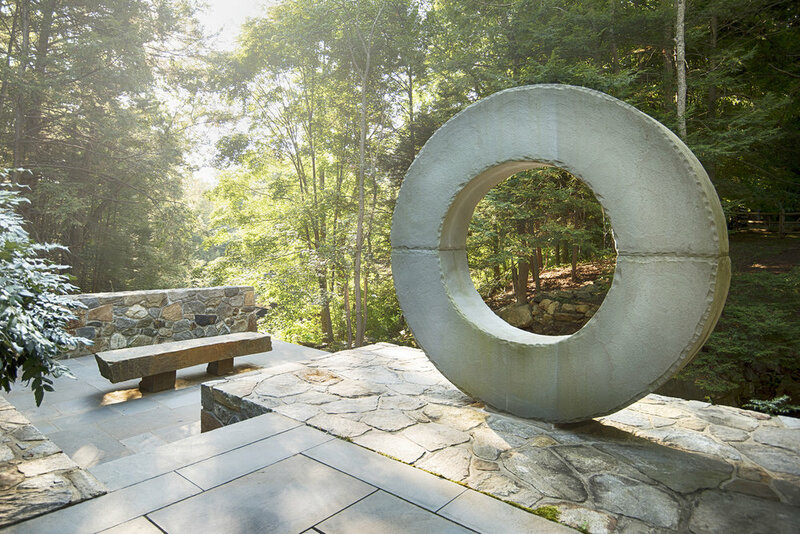 The art adds visual interest and movement to the installation and the round forms contrast perfectly with the strong lines of the stone elements. A mass planting of Rudbeckia blurs the boundary lines of the built environment and natural. The glass pieces were inspired by a Matisse painting with a gold fish bowl in the background of a portrait. The fish in the bowl was reduced to a simple form in orange. These pieces enliven the water feature and allude to their living counterparts. The clean lines and crisp geometry of the triangular form invites a formal response to the unconstrained planting scheme. The interactive, kinetic sculpture works in harmony, yet contrasts sharply, with the complexity of scale, texture and color, beautifully mirroring the verticality of the forest beyond. An exciting and unexpected piece of functional art, the heroic platform lends a strong and contrasting form to the rolling landscape. It serves as both destination and focal point, while inviting different experiences of the landscape for each participant. The pattern is from the Hadron Particle Collider. The circular motif was laser cut into the surface to contrast with the form of the inverse pyramid. The piece was set on point to give a sense of tension with the landscape and create drama for the garden visitor. It flexes from side to side by half a foot or more. Beautiful and artful landscapes create an emotional response; one that provokes thought and allows for reflection. At Land Morphology, we aim to form spaces centered around our client’s needs and wishes. The art and artful implementation in the design is considered from the first conversation we have with the client. This results in the desired outcome and assures a space that resonates.